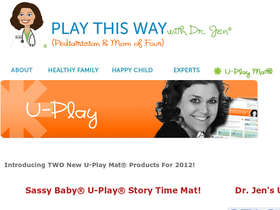 PlayThisWay.com, the online home of Play This Way Every Day, is the brainchild of mother-of-two Dr. Jen. Founded in 2008, the goal of Play This Way is to enhance interactive floor play between toddlers and parents, providing a wonderful educational toy that provides guidance for how to best play together. At PlayThisWay.com you can be assured that all products have been designed by Dr. Jen with consultation from speech or occupational therapists in order to assure optimal design and instructions for use. Visit 58Coupons.com to learn how you can save at PlayThisWay.com with PlayThisWay coupons, PlayThisWay promotions, PlayThisWay deals and PlayThisWay discounts. Get 10% off your order at PlayThisWay.com when you use this coupon code. Click link to see code and shop. When you buy the U-Play Mat Starter Set or Professional Edition your purchase includes card decks and a tote. Click link to shop. Get 10% off when you buy the U-Play Mat Professional Edition at PlayThisWay.com. Use this coupon code to save. Click link.